Stylish Spanish cities and stunning destinations on the fabulous French Riviera are highlights of this special Mediterranean cruise. Each port of call offers architectural, historical and cultural delights, while gorgeous beaches and breathtaking scenes also await you. Then there’s the high-octane action of a Formula One race to witness – a simply unmissable experience. The Monaco Grand Prix is an icon of Formula 1. Arguably the most famous and most exciting race in the sport’s globetrotting annual calendar, this spectacular event sees the world’s greatest drivers race to the limit through the narrow streets and tunnels of glitzy Monte Carlo. During a specially-timed call at nearby Nice, you can head to Monaco and experience the thrills, spills, tension and glamour of the 2019 Monaco Grand Prix on an unforgettable tour. Arriving early on race day morning, you’ll have time to soak-up the pre-race atmosphere before taking your seat in the stands to marvel at the mind-bending speeds achieved by some of the world’s most expensive and technologically-advanced race cars. Alternatively you could stay choose to stay in Nice and stroll Promenade de Anglais to the Bay of Angels; visit the busy Cours Saleya market; or simply enjoy some relaxation at your pick of the city’s beaches. Also on the French Riviera is charming Toulon. Here you’ll find a beautiful old town packed with fine Romanesque architecture, as well as traditional Provencal markets offering a taste of daily life on the Côte d'Azur. 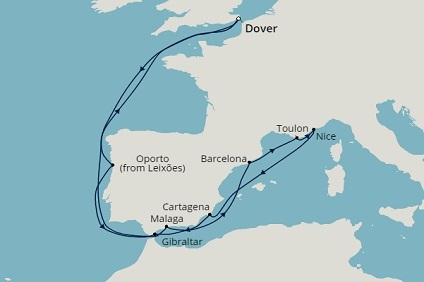 This 16-night sailing also features a trio of captivating Spanish destinations. There’s Malaga, on the gorgeous Costa del Sol, which boasts attractions such as the Picasso Museum and Moorish Alcazaba fortress; and the historic city of Cartagena, rich in Roman heritage. An undoubted highlight will be a stop at the cosmopolitan Catalan city of Barcelona. Here you could take in bustling Las Ramblas, the Gothic Cathedral of Santa Eulalia and Antoni Gaudi’s architectural wonders – no time here is complete without seeing the iconic Sagrada Familia. You’ll also visit Leixoes, for tours to the Portuguese city of Oporto – renowned for its imposing churches and world-famous port wine cellars; and enjoy a restful day in Gibraltar, the Mediterranean’s ‘little bit of Britain’.